First off, I love the feeling this picture gives off. 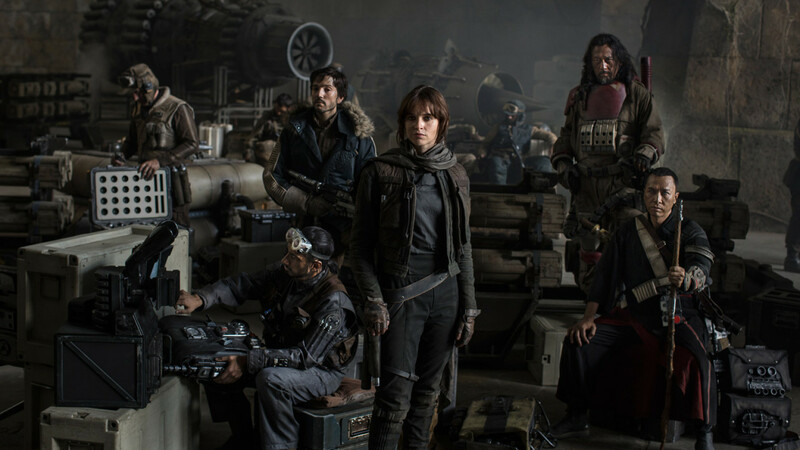 It looks like a ragtag group of rebels picked for the worst job ever. Like they know it’s a suicide mission, but if they don’t do it they know it won’t be done right. Donnie Yen’s character looks blind. How exactly does he help them out? If he’s not a Jedi that uses the Force (this has been said to be a Force-less film), just what does he do to make an impact on the mission? Techie Riz Ahmed seems to have a Galactic Empire insignia on his outfit. Is he planning on going undercover in the quest to steal the Death Star plans? Is he the way in for the rebel group? Did he flip sides and join the rebels? Why does Diego Luna look like Biggs Darklighter? This is a bit of a theory shooting around the internet right now, but the actor is sporting the same sweet ‘stache that Darklighter has. With Felicity Jones’ character already being rumored to have ties to original trilogy character Boba Fett, is this just another tie-in to the universe? With shooting underway in the UK hopefully more news is forthcoming. However we may have to wait until the Gareth Edwards’ directed Star Wars Story (now the re-branded name from Anthology) hits theaters on December 16, 2016. This entry was posted in Uncategorized and tagged gareth edwards, Rogue One, Star wars, Star Wars Anthology, Star Wars: Rogue One. Bookmark the permalink. Joss Whedon States That Parts The Marvel Television Shows Are NOT MCU Canon?? Halt and Catch Fire Actress Joins Narcos Season 3 Cast!